Most beauty experts say to exfoliate once or twice a week. I let my skin dictate how often I indulge. There are times that regardless of how well I clean and moisturize I feel like my pores are clogged, both on my face and body. When I feel that way I usually exfoliate my face 2 – 3 times a week and my body 4 – 5. This is generally the case when the weather is extreme, like during the summer and winter. I always exfoliate in the shower after I’ve let my skin soak in the warm water for a few minutes. When I exfoliate my face I am very gentle but firmly scrub troubled areas like my nose. I moisten my face, put the scrub on my hands and apply. Then I wet my hands and “polish” my face in circular movements. I do this for a minute or two and then rinse thoroughly. I use the face scrub on my neck and chest also. I’m much more aggressive when I exfoliate my body. The skin on my body is very dry and if I don’t stay on top of a routine my skin tends to get super itchy and flaky. I make sure to soften my skin with warm water and then I put the body scrub on a loofah. I rub the loofah hard against my skin in deep circular motions all over my body. I make sure to include my feet and hands as they tend to get very dry as well. There are all types of scrubs, some very gentle and others extremely coarse. I like a very coarse scrub because I feel like it really removes all that unwanted dead skin. The benefits of exfoliation include improved skin texture, cleaner skin (excess dirt and make up are eliminated) and younger looking complexion. It also makes any face or body serums and moisturizers absorb more quickly and deeper, intensifying their benefits. It is important to avoid exfoliation if the skin is not healthy, like when it has an open wound or is sunburn. When it comes to my face I don’t usually use a moisturizer. I apply a series of serums, allowing each one to dry before I apply the next. As for my body I like a thick moisturizer that needs to be massaged into the skin. It takes a little work but it’s worth it. 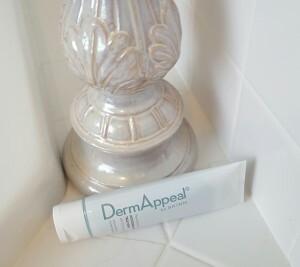 I love products that keeps my skin soft and hydrated. 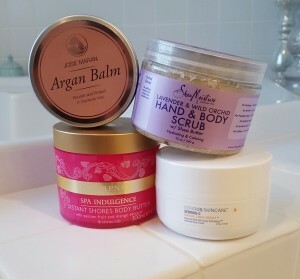 Some women prefer a lighter body moisturizer but I am addicted to the thick ones I use all the time. Exfoliating and moisturizing won’t turn back the hands of time but they’ll help tremendously in renewing your skin to a clearer and more supple appearance.